Adam Lambert, Allison Iraheta and Kris Allen are officially American Idol finalists. Congrats to the trio! ... his first musical theater role: "It was a production of You're a Good Man, Charlie Brown. I was 10 years old, and I played Linus. It was downtown San Diego, and it was pretty wild!" ... fear of country music: "Range-wise, there isn't anything I'd be scared to attempt. But as for styles, country week would be a stretch for me." 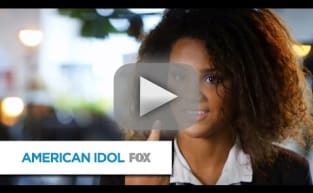 ... American Idol aspirations: "I've been wanting to audition since [age] 9! I had my face against the TV screen, wishing I was on the show." ... Simon's critiques: "He doesn't know me. He says I'm boring, but honestly I'm not. I'll just chill a little bit more because the nerves got to me a little [this week]." ... a theme he'd embrace: "Doing The Beatles would be so amazing. I feel like you can do a lot with their songs. That would be the coolest thing ever." ... tackling Michael Jackson: "I decided on ["Man in the Mirror"] a while back, so it was a little scary. But I was really confident in what I was dong. I was just happy I didn't get any compared to him."